Up earlier than previous mornings, we had breakfast at the hotel. 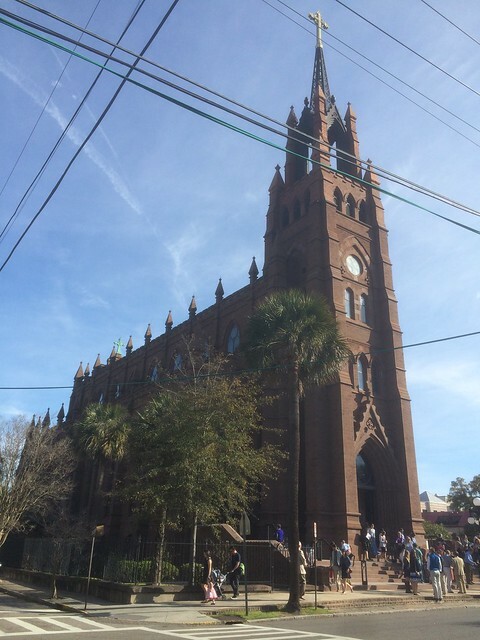 Afterwards, we walked to the Cathedral of St. John the Baptist for a 9:30 am Mass. We had two plans for the day. First, we had to change rooms. We had an upgraded room for the first two nights on the concierge floor, but we needed to switch to one of the rooms in the block that has been reserved for Sharon's meeting. When we got back from Mass, we stopped at the front desk and they actually had a room ready for us. We packed up our stuff and moved. Although a little smaller, this room had a cool view of King Street. Second, we planned to visit Fort Sumter. After we got settled, we walked down King Street and Calhoun Street to the ticket office for the Fort Sumter tours. We ran into two problems. First, the next tour started a little later than I thought. Second, there was no place nearby for lunch. After buying tickets, we walked back towards King Street. We ended up having a great lunch in the bar at Jean de Rue. We had a very sociable bartender from Boston. We wandered back to the dock after lunch. 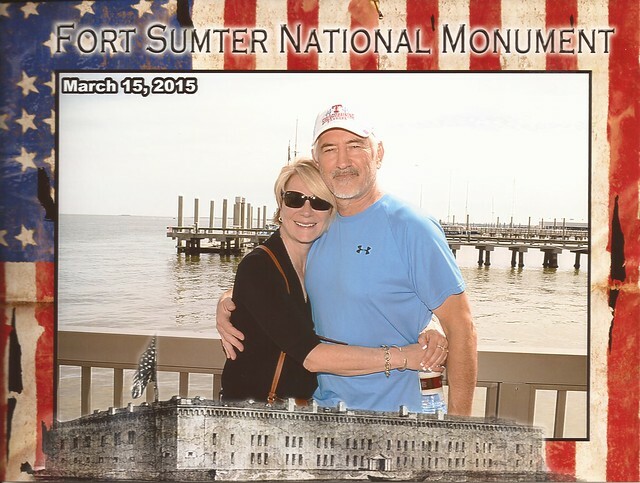 We caught the boat out to Fort Sumter. It was a great afternoon with temperatures in the low 70s. The ride out on the boat had some great views of Charleston and the Cooper River Bridge. Once at the fort, we listened to a ranger presentation for about 10 minutes before spending the rest of the hour exploring the fort. During the ride back from the fort, there was a lone dolphin swimming in the front of the boat. Back at the dock, we walked to the Bar at Husk. After a drink and some taunting text messages to the Gainsleys, we headed back to the hotel to get cleaned up for dinner. We finished the night with dinner at the Peninsula Grill. The food was good, but the staff was odd. Both the waiter and the sommelier seemed more than a little hyperactive. We started with oysters and a wedge salad and had sea scallops and rack of lamb as main courses.